Doc Wayne Global Life Empowerment youth participated in a week long celebration of Earth Day and gave back to the community of South Boston. Supported by the Massachusetts Department of Elementary and Secondary Education’s After-School and Out-of-School Time (ASOST-Q) Grant Program, Global Life Empowerment helps Doc Wayne participants stretch to a new level of competence and readiness in skills essential to their educational, clinical, vocational, and social functioning. In a series of projects initiated and planned by youth, Earth Day was celebrated over the course of a week by joining in on activities at the Franklin Park Zoo, completing a community clean up, and serving as volunteers for the Emerald Necklace Conservancy’s Charles River/Muddy River Clean Up. A closing celebration was held at the Joseph M. Tierney Learning Center to recognize the efforts of youth and staff involved in this week of service. Thank you to our many partners including the Joseph M. Tierney Learning Center, the Franklin Park Zoo, the Emerald Necklace Conservancy, Beacon Communities, and D’Angelos. A special thanks to Jose Sotz, Tyler Germond and Kristian Jones for supporting Doc Wayne youth throughout the project. For more information on Doc Wayne Youth Services, please visit www.docwayne.org, contact us at info@docwayne.org, or follow us on Twitter @DocWayneDtG. 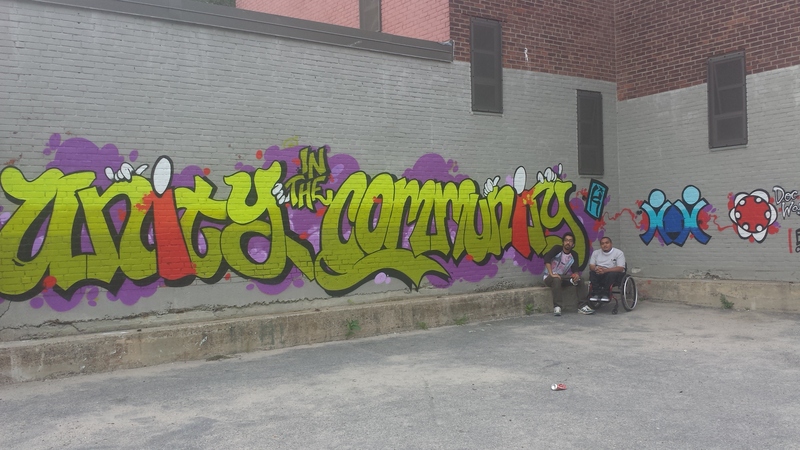 Youth in South Boston were involved in our Global Life Empowerment (GLE) program and together worked on designing and painting a community mural with the theme “There is Unity in the Community!” The mural is complete and images are below. Doc Wayne volunteer coaches, Jose and Andrew, show off the work of their team of youth. Help youth learn to advocate for themselves, their needs, and desires in appropriate ways. Youth work cooperatively, with team members and their coach, to share their responses to suggested changes, lessons learned, and group leadership activities experienced. For more information about Doc Wayne and the Global Life Empowerment program please visit www.docwayne.org or contact us at info@docwayne.org.